Theodore Roosevelt, who at the outset of the Spanish American War was serving the Assistant Secretary of the United States Navy, eventually rose to become the Governor of New York, and later the Twenty-Sixth President of the United States. He is the only president - and the only individual - the receive awards for his writing, the Nobel Peace Prize and the Congressional Medal of Honor. During the War, he became famous as the irrepressible Colonel of the "Rough Riders", a unique cavalry unit. He led his men and others in the famous attacks on Kettle Hill and San Juan Hill just outside of Santiago, Cuba. In American history, he is still greatly admired, because of his untiring energy, his many writings, his foresight in Conservation and Defense, and because he was a President of the People in spite of his Aristocratic beginnings. Theodore Roosevelt, with both his good and his bad points, was and will remain a purely American phenomenon, and an American Icon. Theodore, the son of wealthy New York philanthropist Theodore Roosevelt Sr., and his wife Martha Bulloch Roosevelt, was one of four children. Martha "Mittie" Bulloch was the daughter of a wealthy southern plantation owner, and the niece of a noted Confederate cruiser captain. Theodore Sr. himself was the son of Cornelius Van Schaack Roosevelt, who had started the family fortune by converting the family hardware company into a glass importing business. Later, the business was altered to an investment firm, furthering the family fortunes. This business, under the able leadership of several family members, was to provide young Theodore a lifelong income which he supplemented with his own investments. All of his childhood life, young Theodore was frequently stricken with severe asthma. Interestingly, and unnoticed by the family and apparently Theodore himself, the illness often struck on Sundays. Theodore would spend the night fighting to breathe or would often be taken into the country for fresh air. It is now believed that the illness was psychosomatic, something not understood at the time. As time went on, he suffered less and less from this ailment, suffering very few attacks by the time he was in college. In an effort to improve the young man's health, his father emphasized the need for Theodore to "make himself" physically. He took this to heart, and worked for hours on gym equipment his father bought for him and his brother Elliot. Contrary to popular history, Theodore did not make himself extremely robust physically as a child, but he did improve himself to be average, with excellent stamina, by the time he entered college. Any deficiencies were outweighed by his determination and enthusiasm. Theodore was severely nearsighted to a degree not fully understood by the family until Theodore finally got eyeglasses for the first time in 1872. Early in life, young Theodore took a strong interest in the natural sciences, which lasted his entire life. This interest was enhanced during 1872 when his family spent the winter travelling up and down the Nile in a private dahabieh. Theodore spent much of his time ashore, collecting specimens and practicing his skills at taxidermy. His intention was to become a natural scientist when he entered Harvard University in the Autumn of 1876. At the time he entered college, Theodore was five feet, eight inches tall and one hundred and twenty-five pounds. Theodore was considered by some to have a speech impediment. "In conversation, he spewed words with a force that startled people". This may have been the result of his asthma initially, but had become an established trait by the time he entered Harvard. Whatever Theodore did, he did with intensity. College friends remembered him as an active, enthusiastic, ambitious "bundle of eccentricities". In spite of his attempts to "make himself" physically, Theodore was not a natural athlete, and did not distinguish himself in college athletics. Characteristically, he didn't play any team sports. He was not a champion boxer as he would later claim. Generally, in college, he was considered to be just a bit too odd and consequently he formed no lasting college friendships. However, at college, Theodore's interest in politics was awakened. After graduation, he began attending Columbia Law School, but eventually his active life allowed no time for him to continue. While in college, Theodore had several life-changing experiences. First, his father, the man he respected and loved more than any other, died in February of 1878. Secondly, he met Alice Lee who would become his first wife. She was a member of a socially prominent Boston family. The two met while Theodore was in his junior year. They were married on Theodore's Twenty-Second birthday, October 27, 1880. In November of 1880, Theodore was elected to the New York State Assembly. In 1884, he introduced a bill called the Reform Charter Bill, which aimed to concentrate the power of the New York City government in the office of the mayor instead of the many aldermen. This move changed the entire city political structure, ending much abuse and misuse of power. The bill was eventually passed, but before it did, Theodore suffered a double, terrible personal tragedy. On February 14, 1884 both his mother, who was always a large influence on his life, and his young wife, Alice, died. His mother died of typhoid fever. Alice died of Bright's disease, only four days after the birth of their daughter, named Alice for her. Theodore recorded in his diary that "the light has gone out of my life." The double tragedy caused Theodore to bury himself in his work and up to fourteen bills a day poured out of his State Assembly City Affairs Committee. As part of the wave of activity he rode while he tried to recover from his terrible loss, Theodore served as a delegate to the Republican National Convention in Chicago in May of 1884. It was his first national convention. Here he forged a lifelong friendship with Henry Cabot Lodge as both men fought to have Senator Edmunds of Vermont declared the nominee of the Party. They were not successful and James Blaine was named as the candidate who would later lose to Grover Cleveland. However, during the Convention, Theodore worked tirelessly, and, by the end of the Convention, almost everyone present had heard of him. He found himself appearing positively in the national newspaper reports of the Convention, in spite of the bitter loss of Edmunds. Soon after the Chicago Republican Convention, Theodore left to set up his ranch in North Dakota, the "Elkhorn Ranch". He had been investing in Western cattle for a number of years along with his other ventures, such as becoming a limited partner in G. P. Putnam's Sons, the publisher his first book, "Naval History of the War of 1812". He had initially invested ten thousand dollars in a cattle ranch. Now, to help him recover from the tragedies in his life, he was prepared to exchange his urbane life for adventure in the West. He was prepared to invest more than just money in cattle. He was prepared to invest himself. 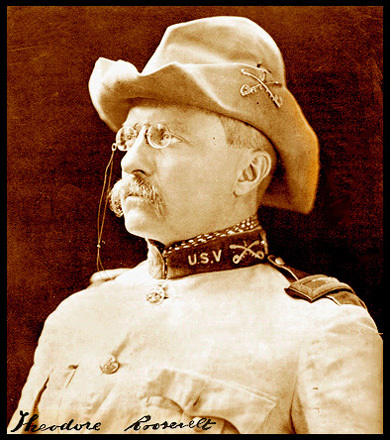 Theodore Roosevelt spent a total of about three years in the West as a ranchman, from 1883 to 1886. During this time he experienced the adventures and lifestyle of the frontier firsthand. Theodore now became the robust, healthy individual for which he had strived all of his life. His energy and enthusiasm again made up for any lack of knowledge he had as a "greenhorn". He experienced forty hour days in the saddle, cattle stampedes at night, roundups, month-long hunts, rides on the lonely prairies, and even the capturing of an outlaw band. On April 11, 1886, the town doctor in Dickinson, North Dakota spotted a figure coming down the street. He described the figure as being "the most bedraggled figure" he'd ever seen. The man was limping and covered with mud. His clothes were in tatters. He was scratched and bruised, but determined as a "bull dog". In short, the figure was "the queerest specimen of strangeness that had descended on Dickinson" in the three years the doctor had lived there. It was Theodore Roosevelt. After a chase and being out in the near-zero degree temperatures for nearly ten days, he had just walked forty-five miles in two days guarding a wagon containing three outlaws, without even taking a break to sleep in those two days! All told, his adventure as a ranchman was a losing venture monetarily. Including lost interest, his losses totalled about seventy thousand dollars. His other investments made up for the loss. It was a time Theodore would not have traded for anything. In later years he wrote many accounts of his experience on the frontier. These experiences would later add to Theodore's popular appeal, and do much dispel the prejudices about his aristocratic upbringing, showing him to be a hardworking man of the people. In 1886, Roosevelt returned to the East, and his house that he had built on Oyster Bay, eventually named "Sagamore Hill". In a surprise to even the family, as close as they were to him, Theodore announced his engagement to Edith Carow, a New Yorker living in London. Edith was very well known to the family as a family friend. They had been secretly engaged for a year. He had been calling on Edith when he journeyed in from the West to visit family in New York, a trip he took quite often. Edith had since travelled to London with her widowed mother. Theodore also found himself being asked to run for Mayor of New York. He took the challenge, in spite of a dismal chance of success. He actively campaigned and fought a good, whole-hearted battle, but he came in third in the balloting. It was a great disappointment to Theodore, so much so that he never even mentioned the race in his autobiography. However, at the time, he apparently did not expect to win, as he had already purchased tickets aboard the ocean liner ETURIA under an assumed name, and was scheduled to sail to Europe and Edith only four days after the election. Theodore and Edith were married in December of 1886. The couple settled in Washington in 1887, where Roosevelt had been appointed to serve on the Civil Service Commission, a post he held until 1895. In that year, he returned to New York as the President of the New York Board of Police Commissioners. The marrage of Theodore and Edith proved to be a strong one, and the two were very happily married until his death. They had five more children - Theodore Jr. (interestingly, Theodore's father was Theodore Sr., and his son Theodore Jr., ...Theodore himself was just Theodore), Kermit, Archibald, Ethel and Quentin. *(The above information was taken almost solely from David McCullough's Mornings on Horseback . (New York: Simon and Schuster, Inc., 1981).